While the San Francisco 49ers and other football players like Tim Tebow and the Denver Broncos are hot picks for the playoffs, so may be some penny stocks in the healthcare industry. Like the phenom quarterback of the Denver Broncos, Tim Tebow, 8 NFL teams are hoping to make it to the big game in Indianapolis while healthcare companies are taking the field in their own Super Bowl starting this Monday in a hotel in San Francisco. The J.P. Morgan Healthcare Conference is the most important and exclusive healthcare conference of the year. As you would only need to contact a ticket scalper for a Super Bowl ticket and pay upwards of $2,000 to get in, you typically need to manage millions of dollars if you wanted to get a ticket to sit in on presentations this coming week in San Francisco and meet the CEOs of some of the largest and most innovative healthcare companies. Investors, especially penny stock traders, are anxious to hear about how all of these healthcare companies plan on capitalizing on the millions of new patients and trillions of new dollars that are on the verge of entering the healthcare system. Presentations are scheduled from the many healthcare monopolies like of Pfizer (NYSE: PFE), Celgene (Nasdaq: CELG) and AstraZeneca (NYSE: AZN) as well as some smaller companies who will be doing the Tim Tebow genuflection demonstrations of religiosity in hopes of some big cash injections like Incyte (Nasdaq: INCY), Illumina(Nasdaq: ILMN) and NuVasive (Nasdaq: NUVA). 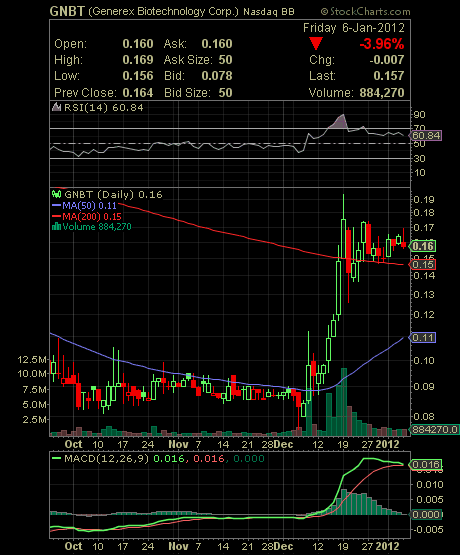 One company which is sure to come out a winner this week is penny stock Generex Biotechnology Corporation (OTCBB: GNBT.OB). GNBT announced last week that representatives of the Company’s wholly-owned subsidiary, Antigen Express, Inc., will be in attendance at the 2012 JPMorgan Healthcare Conference in San Francisco from January 8 through 13. Antigen Express has already announced positive interim clinical data from our Phase 2b study in HER-2 expressing breast cancer subjects makes the time ripe for discussions with prospective partners and collaborations in respect of a Phase 3 study of the breast cancer vaccine. Representatives of Antigen Express will be available over the course of the conference to meet with prospective partners, collaborators, and investors in respect of the Antigen Express proprietary platform immunotherapeutic vaccine technologies. The JPMorgan Healthcare Conference gives Antigen Express the opportunity to initiate discussions with multiple interested partners. GNBT product lines have applicability in diseases such as breast cancer, prostate cancer, ovarian cancer, influenza, and HIV. Efficacy of cancer vaccine AE-37 (Ii-Key/HER2 antigen hybrid) has helped to validate the Ii-Key antigen technology overall. The Ii-Key Hybrid technology allows tumor-associated or foreign antigens (like viral antigens) to potently enhance the immune system’s ability to recognize and destroy cancerous or virus infected cells bearing any of the targeted antigens as well as generate immunological memory. What does a cure for breast cancer mean for GNBT? Basically, successful Phase 2b study in a cure for breast cancer has been achieved by GNBT and in moving into Phase 3 study before a product launch, Generex is “ripe” for a similar scenario as we recently saw in penny stock Anadys Pharmaceuticals, Inc. (NASDAQ: ANDS) when it was acquired for $230 million by Swiss drugmaker Roche Holding AG (OTCBB: RHHBY). Last updated by Aim High Alerts at January 8, 2012 .